In a hurry or know what you want in a custom remove before flight keychain design? Order now with our bulk pricing brackets by visiting here, we will email you a proof of your design for approval before production begins. Our most common item is the customized Remove Before Flight keychains that you can have designed to fit your need. Have them customized to match your business, unit or organization, select the color you would like your polyester streamer to be, have us add your text and/or logo, and we will get it made for you! If you are interested in owning your own custom remove before flight tags, just provide us with your personalized details in the form below, and we will get you a quote. If you live in the U.S. or at an APO address, you will receive free shipping. Note: The use of the term "Remove Before Flight" is trademarked for use on keychains such as these. 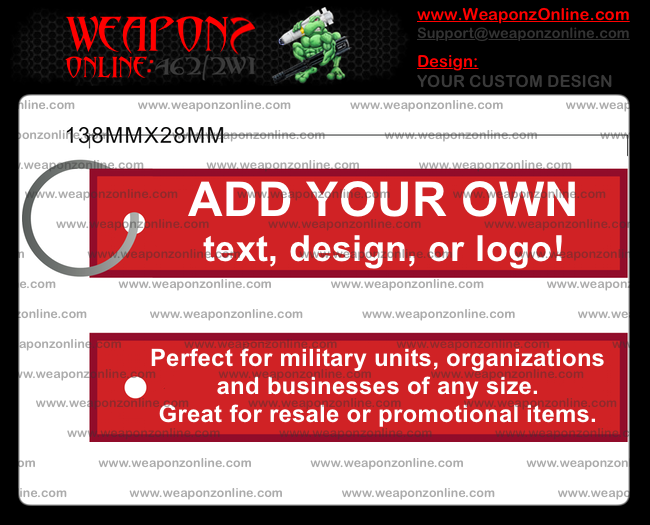 When ordering from Weaponz Online, you are ordering from a licensed producer/distributor of this trademark and are there by protected from any legal action that may arise from ordering from an unlicensed company. Send any attachments or logos. Designs proofs are usually ready the same or next day. Register for a "Custom/Bulk" account, this gives you access to our discounted rates. Make sure you're logged in, pricing will automatically adjust based on the quantity in your shopping cart. Normal orders typically take 18-21 days to be dropped off for shipment. U.S. & APO addresses will receive free USPS Priority Mail shipping, with the option to upgrade during checkout. All other shipments outside of the U.S. will be based on your chosen shipping service, speed, and location.